Video Converter for Mac is a muti_function video converter that can convert between almost popular video and audio files such as AVI, H.264/DivX/XviD, MP4, MPEG, ASF, MKV, RM, WMV, AAC, AC3, MP3, RA, WAV, WMA, AIFF, M4A, MP2, AU,etc. It also can extract your favorite music from the video. Powerful but its operating methods is so easy that everyone can master it quickly and operate it skillfully. 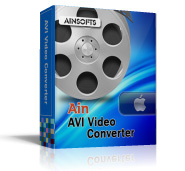 AVI Video Converter for Mac is a professional Video Converter that can convert AVI video to almost popular video formats on Mac with high quality and high speed. For instance, Mac AVI Video Converter helps convert AVI to MPEG, AVI to WMV, AVI to MP4 as well as AVI to other popular formats to on Mac. In additional, this AVI Video Converter for Mac also provides another functions for you to edit your video files, like previewing video, video cutting, etc. 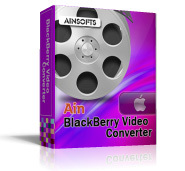 As a converter that is specially designed for BlackBerry, BlackBerry Video Converter for Mac help the Mac users convert popular video and audio files so that them can be played on the BlackBerry. It supports the video and audio format included MPEG, VOB, MP4, M4V, TS, WMV, ASF, MKV, AVI, 3GP, FLV, WMA, AAC, WAV, CDA, OGG, FLAC, APE,etc. This Mac BlackBerry Video Converter provides a convenient and easy-to-use solution for you to create BlackBerry video and ringtone. Everyone could operate it skillfully quickly. FLV Video Converter for Mac is one smart and easy-to-use Mac FLV Converter. It helps convert almost popular video formats to FLV video such as MPEG-4, H.264/MPEG-4 AVC, MOV, M4V, AVI, DivX, XviD, ASF, WMV, MPEG-1, MPEG-2, 3GP, etc. So that you can play video on iPod, iPhone, Sansa, Sony Walkman, Apple TV, PSP, Zune. With this Mac FLV Video Converter, you can also experience its more unique function setting. For example, you can shutdown your PC automatically after conversion is complete and preview the video before converting and so on. In additional, this iPad Video Converter has many other advantages. For example, you can clip any segment of the video for converting and shut down your PC automatically when the conversion is complete and so on. Special for all the iPhone fans and Mac users, iPhone Video Covnerter for Mac can help you convert all popular video formats like AVI, WMV, MPEG, 3GP,3G2, FLV, MPV, MOD, TOD, WOV, MKV, RM, RMVB, VOB, DAT, etc. to iPhone MP4 video. And it also could convert audio files and extract music from video files to iPhone MP3, AAC, AMR, etc. With this Mac iPhone Video Converter, you can adjust the video size, video quality, audio quality and other parameters of output files so that it plays best for you. Download it and have a try quickly. Do you want to enjoy your favourite movies on your PSP/PS3 when you have a rest? PSP Video Converter for Mac can help you convert all popular video formats to PSP video such as AVI, MPEG, WMV, MOV, RM, RMVB, 3GP, H.264/AVC, MP4, etc. It can also convert audio formats or extract music from video files to PSP MP3, M4A, etc. So you can play the movies or video you like on your PSP or PS3. MP4 Video Converter for Mac is a powerful MP4 to video Converter that can convert MP4 Video to almost popular video formats like AVI, MPEG, WMV, MP4, MPEG-2, MPEG-4, MOV, M4V, VOB, ASF, 3GP, etc. So you can play the movies or video you like on more devices such as iPod, Apple TV, PSP, PS3, etc. With this Mac MP4 Video Converter, you can cut the movies or video into some segments and choose one you like to convert. It also has many another functions. Download it and have a try quickly. Convert almost popular video formats to MOV Video with unmatchable speed and high quality with MOV Video Converter for Mac. Supported video formats includes AVI, WMV, MPEG, MP4, FLV, MKV, RM, 3GP, etc. In additional, this MOV Video Converter for Mac allows you extract music from video and convert to MP3, AAC, WMA, etc. You can also preview the movies capture the beautiful pictures of movies with this Mac MOV Video Converter. Download it and have a try quickly.